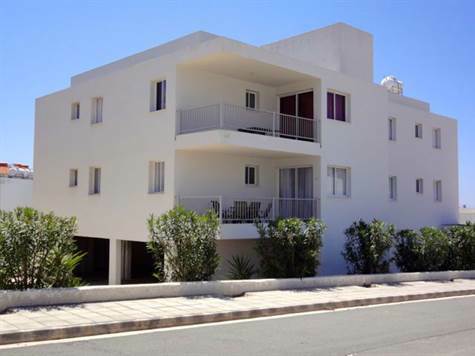 Cyprus Property Blog by Cleo : Peyia Apartment - Price Just Reduced! Lovely area & well kept property. Peyia, Paphos - This delightful first floor one bedroom apartment is situated in a quiet cul-de-sac close to the traditional village of Peyia and the popular tourist destination of Coral Bay. The property features a spacious open plan living room with lounge, dining area and well equipped end kitchen. Patio doors in the lounge provide easy access to a covered balcony with stunning mountain views. There is a good size double bedroom with a wall of fitted wardrobes and a family bathroom with modern finishes. At the centre of the small project is the swimming pool with toilets and showers to the side. There is plenty of space surrounding to relax and the pool has roman steps for easy access. Please refer to MLS #:1265 when inquiring.